MPAA Rating: PG for fantasy action/peril and some language. Running time: 113 minutes. 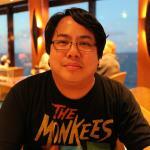 Released by Walt Disney Studios Motion Pictures. The night before my six-year-old daughter Moira and I went to the screening of Alice Through the Looking Glass, we caught up on Tim Burton’s Alice in Wonderland from 2010, which was Moira’s birth year. Dark, torpid, and almost entirely unnecessary, Alice in Wonderland was one of those movies which focused more on the computer graphic-fantasy world of Underland than its characters or making a cohesive story. It was a kitchen-sink affair, if you will; everything was thrown into it, from the overabundance of CGI to pop music dancing to the incoherence of the plot that made my head spin. However, for all they put onscreen, they still couldn’t make it exciting. 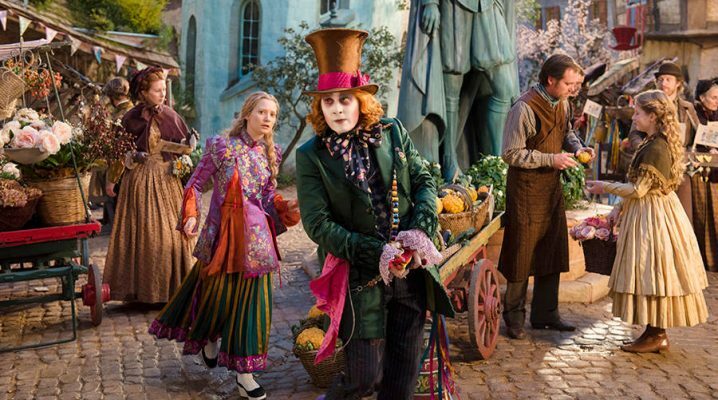 By contrast, in taking the reins over from Tim Burton, director James Bobin has made Alice Through the Looking Glass an entirely exciting film with a more straightforward story, with less of the crazy antics of Burton’s original. By paring down the amount of conflicts and simplifying, Bobin and screenwriter Linda Woolverton (who also wrote the 2010 film) have improved upon the original, evident by even the first scene, as Alice Kingsleigh (Mia Wasikowska) uses her cunning to outpilot a band of seafaring pirates, making a more exciting and dramatic scene than anything in the original could have mustered. In these opening moments, we see the decisive young woman Alice has become, and she cuts a strong figure throughout the film as someone who refuses to let traditional gender roles – or any kinds of roles, for that matter – define her, letting her actions speak louder than her words. 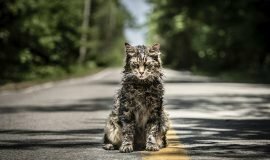 The character of Alice becomes a little bit of a teaching tool to get the film’s point across: “You cannot change the past, but you can learn something from it,” says the film’s heavy, Time (Sacha Baron Cohen), a clockwork man in charge of, well, time. Every adage you can think of concerning time being a danger (such as “time is a friend to no one”) is exemplified by Cohen’s character, who seems to be a cross between Captain Ahab and Cohen doing a fair Werner Herzog impersonation. 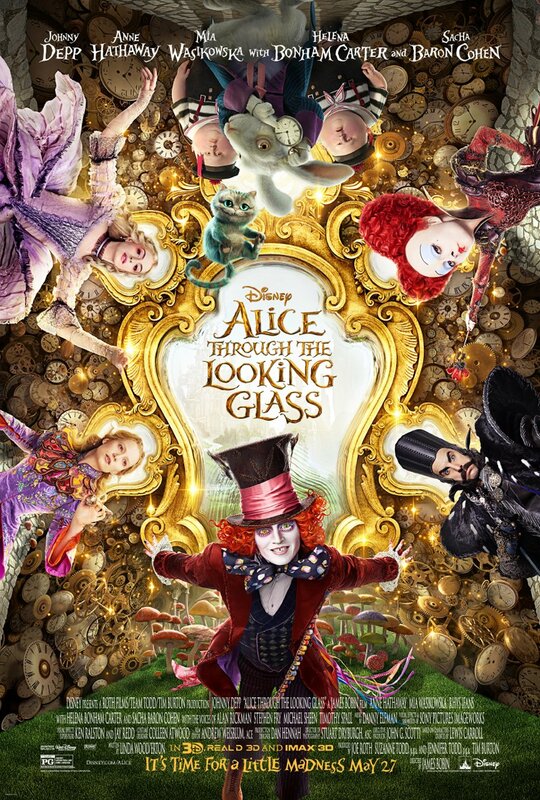 In order to save her friend The Mad Hatter (Johnny Depp), Alice steals the Chronosphere, the linchpin piece of the clock which Time must maintain to keep life in order and balance past and present. Without it, all of time cannot function properly nor move forward, the latter of which is another lesson Alice Through the Looking Glass imparts on us. So what’s wrong with The Mad Hatter? He stumbles upon the first hat he ever made as a child and gave to his father, Zanik Hightopp (Rhys Ifans), who is seen in the past to dismiss it out of hand, thus starting off a chain of events which eventually leads to the Hatter’s estrangement from his family. The hat’s existence throws him into insanity as he believes with everything he is (even to the point of death) that his family is still alive, after having long believed in their demise at the hands of the Jabberwocky. Alice uses the Chronosphere to travel back in time and rescue his family, but Time’s warnings about not being able to change the past hold true; we can only correct the present and make the best of what and who we have. It’s a lively, action-filled film full of good morals taught with a caring touch, even if some of the choices Bobin opts for may seem a little heavy-handed and cliché at times. The sibling rivalry between White Queen Mirana (Anne Hathaway) and Red Queen Iracebeth (Helena Bonham Carter) is dissected in the simplest of terms, which seems a little too pat for the eventual conflict they’d endure in the first film. 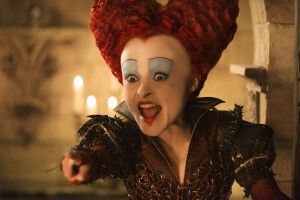 As hammy as this storyline can be, it’s still startling to see how the Red Queen became the terror she is and to see how not-innocent the White Queen was as a child. 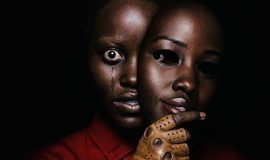 Also suspect is the “what happens if the past and present versions of the same person meet” trope Woolverton hands us and how it’s dealt with; the film’s climax seems a little bit more than its share of Timecop and Donnie Darko, with the present growing ever more unstable the more time Alice spends in the past. However, there’s love behind it all, and Bobin and company are to be applauded for trying to make a modern-day fable for today’s audiences. Cohen brings humor and a surprising emotion to Time, even though the character’s construct is to be dispassionate. Time is neither friend nor foe, but the constant that needs to simply be, and Cohen’s funky portrayal is one of the major attractions of this film. To contrast Time’s barbed apathy, Wasikowska once again gives Alice a valiant spirit and a warm heart as she learns a valuable lesson about believing in your friends and family. Since first seeing her in The Kids Are All Right (the sixth movie I ever reviewed), I knew she would be a talent worth watching, and she hasn’t let me down since. 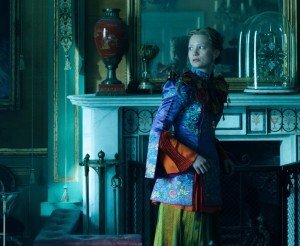 In a world full of questionable female roles and role models, Wasikowska’s Alice rises above and shows us strength and wisdom while still finding time to be the action hero. Even though she’s relegated to mere bystander in the time-travel scenes (for fear of what is essentially The Butterfly Effect), it is her detective-like skill and reasoning which allows the movie to thrive. 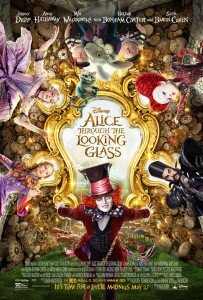 I realize I’ve said the word “lesson” a lot in this review, and there are quite a few of them in Alice Through the Looking Glass. However, these morals aren’t quite wrapped up with a “MESSAGE!”-type of bow, as Keenen Ivory Wayans so mirthfully shouted at points in Don’t Be a Menace to South Central While Drinking Your Juice in the Hood. Instead, they’re just allowed to unfold through Alice’s eyes, having to go through the growing pains to earn the knowledge on the other side. It’s a marvelous film which balances morals with entertainment, all while charting a young woman’s growth into herself. The bittersweet end credits dedication to the voice of Absolem, Alan Rickman, seems to serve a twofold purpose: 1) to celebrate the man’s final role and his friendship, and 2) to sadly cement what Time’s purpose truly is – to give us the best and to claim it back when we’re done. 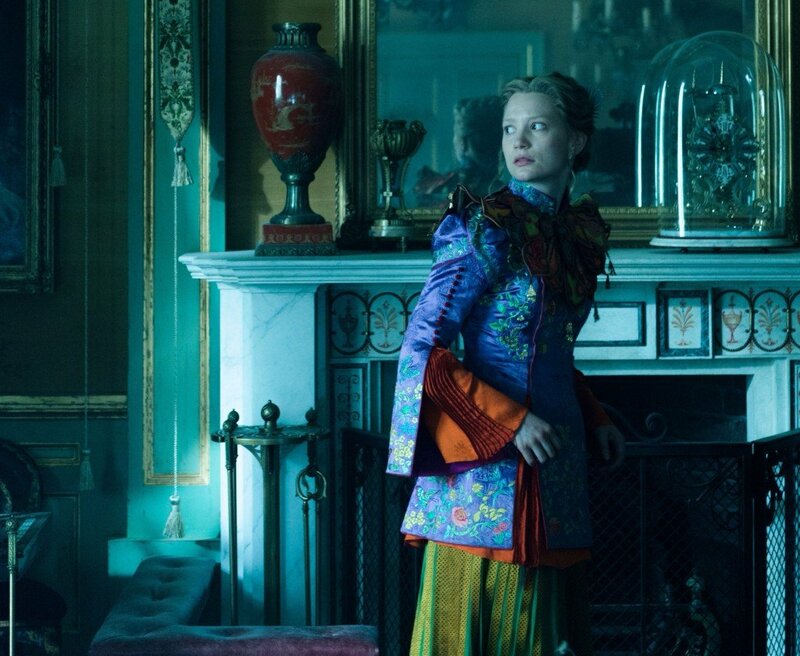 Alice Through the Looking Glass may not be the definition of a “Disney Classic,” but it gives us a lot more to chew on than your average children’s film.